Link exchanging is welcome. Please make a link to Kabahinfo using a text or one of the below banners and e-mail me. I will visit your site and make a link to your. 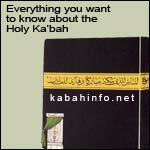 alt="www.kabahinfo.net : everything you want to know about the Holy Ka'bah"